A draft of the nation's largest habitat conservation plan, covering 9.3 million acres of the western Mojave Desert, was released Tuesday in an effort to gather public comment before it is made final, the U. S. Bureau of Land Management announced. portions of Inyo, Kern and Los Angeles counties. It is one of a handful of BLM regional plans in the California desert intended to establish protections for the desert tortoise and dozens of other imperiled species. The plan seeks a compromise between species protection and desert uses such as off-roading, ranching and mining, the BLM said. The agency will schedule public hearings this summer. A summary of the draft plan is available online at http://www.ca.blm.gov. The full plan can be viewed at the BLM office at 22835 Calle San Juan De Los Lagos, Moreno Valley, CA 92553. The agency plans to post the full text online at a later date. 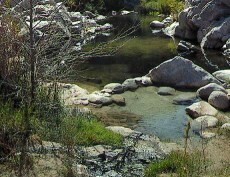 Moreno Valley address, or sent by e-mail to wmojave@ca.blm.gov. For further information, call project leader Bill Haigh at the BLM at (760) 252-6080.